I’ve been watching Friday’s severe weather potential with a bit of interest since Sunday. It hasn’t been clear whether ingredients would come together for severe weather with different computer models offering up very different outcomes. This afternoon, both the 18z NAM and GFS show the potential for a rather sizable severe weather event including tornadoes. The synoptic setup is pretty straightforward. A deep closed-low near the southern tip of Hudson Bay continues spinning with a number of shortwaves advancing east across the region. At the same time, mid level wind fields strengthen during the day tomorrow approaching 40 knots out of the west at 500mb while a weak wave of low pressure forms along a front to the west strengthening the southerly flow in the boundary layer. Now the GFS (the NAM has been showing this for a while) develops a strong low level jet over the region Friday. This creates a highly sheared environment in the 0-3km layer. Take a look at these hodographs from the 18z GFS and NAM for 18z tomorrow valid at 18z Friday. The long and curved hodographs are very impressive. In addition the models are developing some surface based instability tomorrow. The extent of the destabilization is very unclear, however. So what will happen? This setup does seem like it could morph into a classic low CAPE/high shear severe weather day if the current depiction by the GFS and NAM comes to pass. Hail is quite unlikely but damaging winds and tornadoes are possible. The threat will depend on the amount of destabilization which is unclear and dependent on cloud cover and convection earlier in the day. That said, lifted condensation levels (LCLs) are quite low so any storm that begins rotating can produce a tornado. 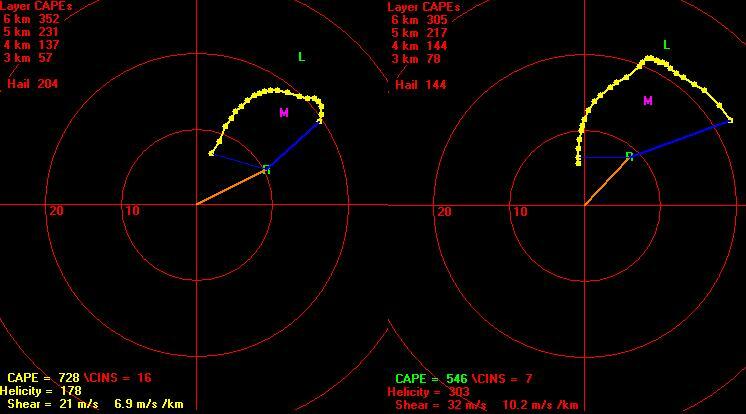 While the NAM is likely overdone at 18z Friday – many of the parameters, especially the 70 j/kg of 0-3km CAPE and storm relative helicity >300 m2/s2, is sufficient for tornadoes and even significant tornadoes per Davies, 2006. We’ll have to watch tomorrow’s setup closely – I’ll keep you advised. If some of the model solutions turn out to be correct tomorrow may be a very busy last day of work before I leave for vacation! Active Pattern Continues – Thursday Severe? It’s been an active few weeks here in the state with the threat for more severe weather Thursday and Friday. While the threat is a bit uncertain there is the potential for a high-end outbreak if a few of the moving parts come together. Take for instance this forecast hodograph for BDL for 23z Thursday. Impressive! 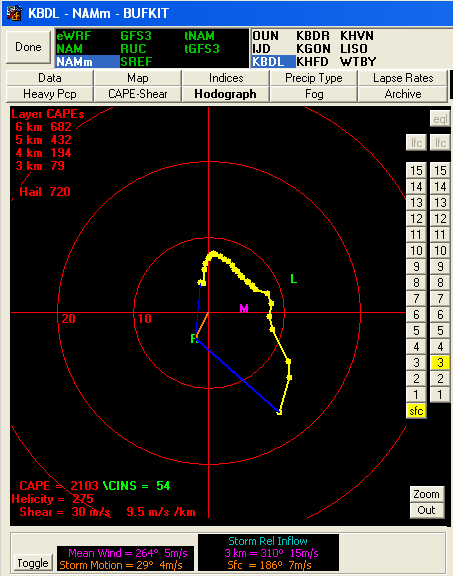 Strong shear (both speed and directional) indicates the potential for supercells and tornadoes. 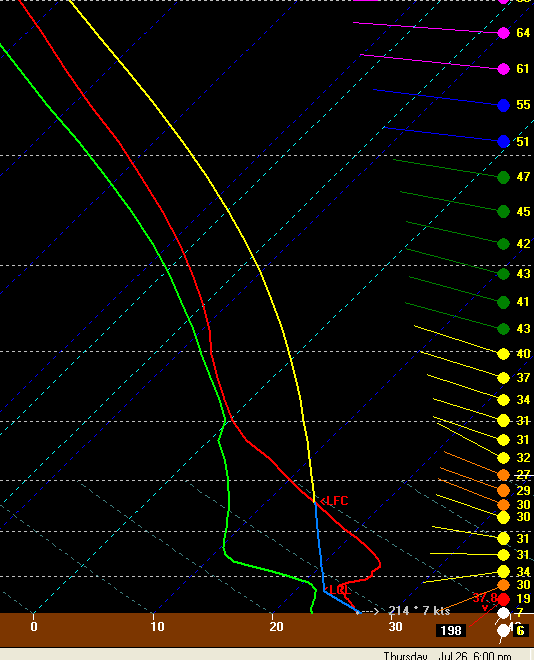 Soundings also show fairly impressive instability thanks to steep mid level lapse rates and a moist boundary layer. The threat isn’t so clear cut, however. We will be dealing with morning convection with associated cloud cover for a portion of the day. A warm front will straddle the region that could be the impetus for non-severe convection during the day. Will mid level lapse rates steepen as modeled? Will the warm front even make it through? Will subsidence behind the morning MCS suppress convection? All things that will need to be ironed out in time. While it’s unclear how the threat will evolve – the potential for a high end severe weather event is there. Strong wind fields including a low level jet always captures my interest – particularly this time of year when water temperatures are near their warmest. This is a convoluted severe weather threat developing across the state this afternoon with several things working toward a major, high-end outbreak and several things working against. There’s no question the atmosphere will be primed for big severe weather later today. As I’ve written about quite a bit on this blog we will have an elevated mixed layer over Connecticut this afternoon with northwesterly winds in the mid levels of the atmosphere. This is an immediate red flag for high end severe weather potential!! The elevated mixed layer is a region of very steep lapse rates (temperatures decreasing quickly with height) 2 to 3 miles up in the atmosphere. When coupled with warmth and humidity near the ground a “loaded gun” sounding develops. If you can tap into that instability – watch out! The 12z sounding from Pittsburgh shows an elevated mixed layer firmly in place. The OKX sounding shows an EML as well with a lifted index of -4.5C. Not bad for 12z. So we have the instability – but do we have enough wind shear? Wind shear is important in promoting storm organization and developing rotating updrafts. Without a rotating updraft you’re not getting big hail. Today it appears we have the shear. 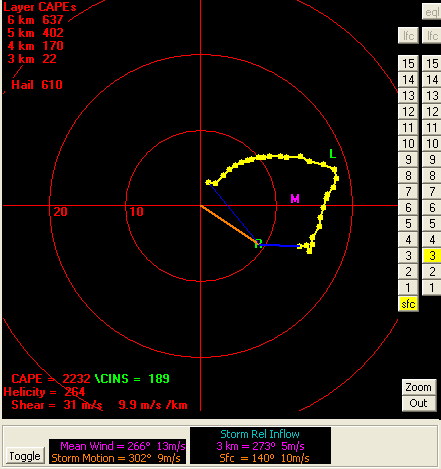 While winds at 500mb (or about 3.5 mile up) are only modestly strong there is significant directional shear. Winds near the ground will be out of the south while winds upstairs will be out of the northwest! With enough speed this will develop long and curved hodographs as seen above off the 6z NAM. This indicates supercells are possible. The low level shear especially is quite impressive indicating the potential for tornadoes. Both deep-layer and low level shear is not to the level it was last June 1st, however. So what’s the negative? What’s working against today’s storm potential is the lack of a solid trigger and large scale subsidence. You’d like to see some type of shortwave or disturbance in the atmosphere with falling 500mb heights. That’s absent today. What this may do is reduce the areal coverage of storms but no necessarily decrease the severity of storms. While storms may be isolated they have the potential to be quite severe. 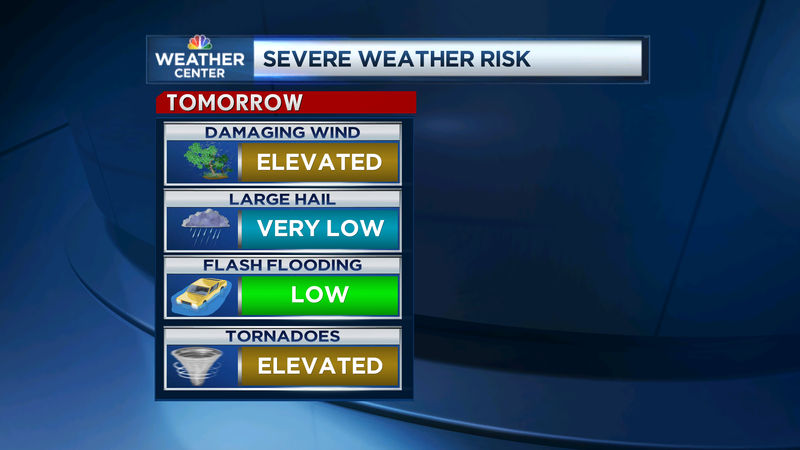 High-end severe reports and even tornadoes are possible in western New England and New York today. What makes the threat even more difficult to ascertain is the mesoscale convective system that has developed over Ontario and Lake Ontario. Not sure how that will impact downstream development.